﻿ ﻿ About us - ArtBox gallery. Our gallery opened its doors in 2002 to welcome all who appreciate interior art. 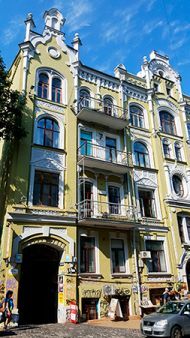 We deal in unique and diverse art work by Ukrainian artists; also we have a large assortment of art on display. 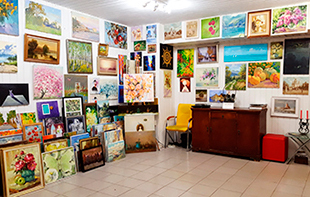 Our main activities include organisation of exhibitions, sale of pictures, and interior art&design. We appreciate our clients and guarantee high quality of service; we offer competitive prices and most importantly provide custom-made solutions. Over the years more than one thousand clients trusted our professional opinion in selecting perfect interior design art for their home and office. Our experienced designers work to make any interior exquisite and welcoming. Our services on offer vary from project design to sourcing appropriate artwork for your project. Also we do any type of wall painting, painting on furniture, and painting on interior design items. Looking for a gift idea? We are here to help. A portrait is a great present for any occasion; place an order with us and a portrait may be painted from life or from photograph. Whether you fancy a reproduction painting, landscape or still life, we have all of those styles of offer. Please keep in mind that any subject fancied by you may be painted on order. Also the “ArtBox” Gallery has over 500 types of frame design to help you frame your art and perfectly match it to your interior. You are welcome to stop by and consult with our associates, also we do house calls and home deliveries.